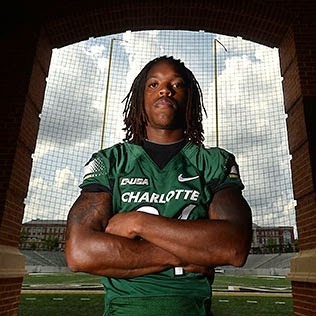 Alan Barnwell, the Charlotte 49ers' second-leading rusher last season, is one of three players who have been dismissed from the team for violating team rules, along with linebackers Kendal Parker and Terry Caldwell. Safety Kariym Gent has also left the team. Barnwell had been suspended since January, when he was arrested on charges of driving with a revoked license and possession of drug paraphernalia. He rushed for 636 yards and scored five touchdowns last season as a redshirt freshman. Caldwell was Charlotte's fifth-leading tackler with 55. He also had 2.0 sacks and recovered two fumbles. In other news, assistant coach John Russell has left the program to pursue other professional opportunities. Aug. 28, at Campbell, 7 p.m.
Sept. 6, Johnson C. Smith, noon; 13, at N.C. Central, 5 p.m.; 20, at Elon, 1:30 p.m.; 27, Charleston Southern, noon. Oct. 4, at Gardner-Webb, 1:30 p.m.; 11, at The Citadel, 2 p.m.; 25, James Madison, noon. Nov. 8, Coastal Carolina, noon; 15, Wesley (Del. ), noon; 22, Morehead State, noon. siness Journal athletics director of the year award, joining Duke's Kevin White, Missouri's Mike Alden, Arizona's Greg Byrne and Washington's Scott Woodward. Rose is the only finalist who is not from a Bowl Championship Subdivision school (Charlotte joins Conference USA in football in 2015). -- 49ers women's basketball player Gabby Tyler has decided to forego her final season of eligibility. Tyler, a forward who graduated in 2013, missed the 2012-13 season due to a concussion. She averaged 12.0 points and 7.7 rebounds last season. -- Charlotte's Franco Castro is playing in the NCAA golf Raleigh regional beginning Thursday at Lonnie Poole Golf Club. Castro led the 49ers with 16 rounds under par this season. Charlotte, which finished fourth in the recent Conference USA tournament, missed the NCAA tournament as a team for the first time since 2004. We have 49ers and Panthers running afoul of the law, and we have Charlotte football and men's basketball with people fleeing the programs. Tough times. It is amazing how many people in this world waste an opportunity for something stupid. It certainly didn't take long for the UNC Charlotte Football program to have integrity and character problems, did it? And this was such a good thing... Why? You're seriously questioning the benefits of football for this university because 3 kids felt they were bigger than the team? How pissed off at the world are you right now? Get a life dude, the university has a higher academic and community profile than ever before. Unlike a certain school in Orange County, Charlotte is holding players accountable. UNC Tarheels busted for athletic academic fraud was the worst in US history and well documented and diligently being cleaned up. The punishment is crippling. UNC will recruit sign and play ONLY white athletes for football and basketball. short term setback but you have to protect the program if you want long term success. Irony- the observer blogs some goofy award nominee for the AD, same day the mens basketball team slapped with ncaa penalty. Makes perfect sense. You mean UNCC? This is not the AD but the UNCC administration when it comes to academics.